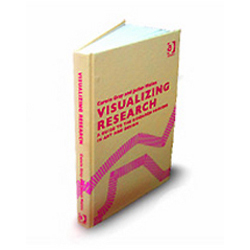 This site is an essential component of the book Visualizing Research: a guide to the research process in Art and Design by Carole Gray and Julian Malins. The book aims to guide postgraduate students in Art and Design through the research process, using the metaphor of a 'journey of exploration'. The book may be used in conjunction with a formal programme of study - from masters to doctoral level - in the development and implementation of a research project. Visualizing Research published in 2004 by Ashgate (now Routledge), includes over forty visuals - but only in black and white. So this website includes colour and/or multimedia versions of these visuals. Each chapter of the book has a number of sections exploring different research topics, at the end of which there are suggestions for 'reflection and action' on the material explored. The web site extends this feature by providing example tasks. Links to key research resources are included in the site. We hope that you find both the book and this website a useful companion on your journey of discovery and in stimulating your own attempts at Visualizing Research.